5 Feather Bundle - You Pick the Colours! We hand-glue each bundle using our longest available Whiting Rooster feathers, these extensions can be over 12" in length! Each bundle comes with 5 micro rings, so you may reuse or unbundle the extension, OR we can attach it to a reusable clip-in for you for an extra .50 cents. For installation instructions, please see our tutorial video below! Each of our gorgeous bundles has 5 feathers - typically 1-2 grizzlys, 1-2 bright colours, and 1-2 base colours. 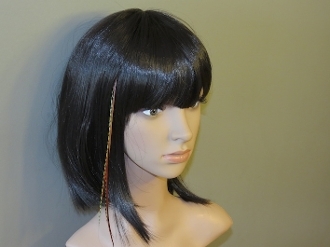 Also available in 3 or 7 feather combinations. Our Lilybelle Feather Extensions Bundles are a 100% natural product. As such, they can be washed, blowdried, curled, and treated just like normal hair! With proper care, they can last installed for 2-4 months - though some re-adjustment may be necessary as your hair grows. We hand dye each of our coloured feathers in a natural dye solution which should remain 99.5% colourfast. Some minimal colour loss may occur if certain colour-stripping shampoos or chlorines (from a swimming pool) are applied.